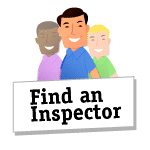 MyHomeInspector.Biz is a licensed and certified home inspection company serving the New York Metro and Fairfield County Connecticut Areas. Our licensed and certified home inspectors are ServiceMagic screened and approved professionals with over 20 years experience in the home building and remodeling industry. Being a former contractor for nearly 25 years has given me the advantage over some and is a plus in this business as I have literally seen, built, fixed and repaired everything a house has to offer. It also allows me to understand how individual systems and components of a house affect one another both in good and bad ways. Another thing it has taught me is how to spot cover-ups and quick, cheap fixes that don’t last. 1. Nice and new 3 pronged grounded outlets on a 2 wire ungrounded electrical system. There’s only one way to test for this and most buyers wouldn’t even think twice to test it. You see a modern 3 pronged outlet and assume it’s always been there and working fine. The average home buyer isn’t walking around with an outlet testing device and wouldn’t even think to do so. Only during an inspection, and only if your inspector is doing his/her job will this be detected. Again, if not installed properly, and on the proper wires, anyone can push the little button on the GFCI to trip it. It almost never fails but this isn’t telling you if it’s working properly or if the wires it’s hooked up to are the proper ones. Only with a GFCI testing device can one tell if it is working as intended. 3. Freshly painted basement floors. Unless the majority of the house has been renovated or updated, seeing a newly painted basement floor when nothing else in the house has been touched is a huge red flag to me. You would think owners would have wanted that nice new looking concrete floor when they were living there, right? This is a sign that water marks and stains are trying to be covered up. Other little pieces of the puzzle come into play here such as stored dehumidifiers, wet vacs, etc.. All these things lead to one conclusion to make me look further and more closely. You’re probably saying to yourself – WHAT ARE YOU TALKING ABOUT? On 2 separate occasions while inspecting the attic they were freshly painted. The sheathing and the roof rafters had been painted by a sprayer. Now most here would say that’s part of a mold remediation program that was put in place due to the attic having mold but there are other things to look for to come to that conclusion. If there are no new roof fans or ventilation systems to go along with this new paint job then there’s a problem. You can tell if the original attic vent system has been altered or added to and in thee 2 cases they weren’t. This is a true “cover up” and a cheaper way to hide mold in an attic compared to having a costly mold remediation done and a new venting systems installed. 5. Furniture that has been moved in a room. Furniture always leaves indents in carpeting or lack of wear spots on hardwood floors. If you suspect the layout of a room has been recently changed then it’s a good assumption something’s being hidden on the walls behind the newly moved furniture. As Home Inspectors we are not supposed to move items and the inspection is to be minimally invasive. Most buyers aren’t going to move furniture to get a look behind it nor are they thinking to do that. There’s always ways to take a peek at what’s behind door #1 and your home inspector should be doing this. 6. Excess boxes, clutter, etc. The best way to hide defects to flooring in the house or in a garage is to have stored items in these areas. Now sometimes this is a natural thing for home owners to have so you have to look at the rest of the house and how it is kept. If the rest of the house is in a cluttered state then you can say this is just how these people live. But, if the rest of the house is kept clutter free and neat, you can assume there is something under this clutter that needs a closer look. I always recommend to my clients that if the clutter is still there during the sales process, make sure to do a thorough walk through and have a stipulation in your contract covering you from any surprise that might arise once the clutter has been moved out. If you’re trying to sell your vacant home I can understand trying to save a few dollars here and there. Knowing a buyer is having a home inspection done and leaving one of the mechanical systems off is not a good sign and one that happens all the time. You usually don’t know the heater is off until it’s time to test it and by that point in the inspection you don’t have enough time to turn it on and wait for the water to heat up (nor are we allowed to turn on systems that are off). When this happens I again tell my clients to have a clause in the contract regarding this and make sure it is checked at the final walk through. 8. The helpful home owner. Any time a home owner is present at the inspection and is more than eager to assist me and “show me the way around” is a huge red flag. More times than not they will try and lead you down the path they want you to take and try and distract you with useless conversation. It’s very difficult to politely say no thanks in a politically correct way without offending them. I do my best and pride myself on being professional and courteous at all times to all parties involved. I often excuse myself and say I have to use the bathroom or take a call or whatever, then try and slip away to go to areas I have been “lead” away from. It makes the inspection longer using all these evasive measures but in the end it’s usually worth it. These are just a few things I look for during my inspections. There are many, many more little things that when added up together give a good home inspector the full picture and story of a home.